What is the Internet of Things? The IoT (Internet of Things) is the development of everyday objects having network connectivity and allowing them to send/receive data. 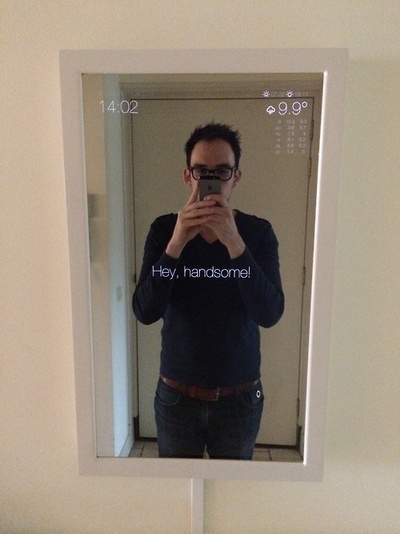 This makes way for great things like The Magic Mirror created by Michael Teeuw, which is a mirror powered by a Raspberry Pi that acts as a modern barometer. With an LCD screen behind a 1-way (observation) mirror, you get all the info you can pull wherever you want. What can IoT do for my office? The advantages are endless as you can apply the IoT to basically anything you want, from soap dispensers in the bathroom to the blinds of an office block. Automating these basic things saves time and money, especially with being able to monitor and adjust your energy usage as a whole: You'd be saving the environment! Of course this isn't without risks, privacy is crucial to companies and their employees. People tend to be more comfortable with Internet of Things tracking what they're doing, in their own homes. In the workplace however, this may not be the case. It's very important to keep a clear divide between their professional and private lives, this means that you have to be very careful to not collect and/or abuse personal information collected using IoT. The easiest way to secure your office/employee IoT devices would be via identity! It would also allow for personalisation based on each employee's authorisation. For instance let's say you're giving a presentation on a private client (you can't share the info with people that aren't on the account), and someone wanders in by accident: Through IoT you could have it so that the presentation goes blank until the person leaves. An additional step in securing your IoT devices would be to add 2-factor authentication. Afterall we all know how easy it can be to misplace your ID badge, and how easy it is for someone to get into somewhere they shouldn't be, using it! Have a backup in place! As always, a backup or disaster recovery solution if very important. Especially if you're doing important things with IoT. We don't want to have the feeling that we've reverted to cave men again just because the WiFi has gone off! All of this stuff is super useful, if you can actually use it. That means it's incredibly important to have an easy way to view and find trends in this data, afterall what use is data that can't be managed! These are my thoughts on how the Internet of Things can be applied to an office environment to save money, make life easier and a little smarter. Over the next few years we'll most likely see a rise in these kind of environments, even home's are getting smarter now with Samsung's Smart Things, British Gas' Hive etc. So here's hoping for smarter places! I'll be back soon with some holiday blogs, til then!